You can’t have your cake and eat it too. It’s a hackneyed expression that never made sense to me. If you give me cake and tell me I can’t eat it, then you and I are going to have a big problem. That old adage came to mind when I read the recent news stories blaming higher meat prices on ethanol. I’m glad livestock prices are finally recovering. I’m glad corn farmers have the livestock industry and the ethanol industry as customers keeping the price of corn from dropping below the cost of production. Skimming headlines today, I first read a story about why corn prices are down, then I read a story about how high corn prices caused by ethanol are increasing the cost of meat. TV commentators have jumped on the bandwagon, telling consumers that they’ll be paying more for meat because the ethanol industry is using up all the corn. Really? One only has to look at the record crops, the enormous corn surplus of over 2 billion bushels, and the modest corn price, hovering just around $3.20 a bushel to know that statement is ridiculous. A lot of this misinformation is coming from that very strange, but well-funded alliance consisting of the meat industry, environmentalists, big oil and grocery manufacturers. If corn farmers are the cake, and you want corn prices to return to below $2 a bushel, then that old adage finally makes sense–you really can’t have your cake and eat it too. I am a huge fan of Oprah Winfrey. I grew up watching and admiring her. In fact, I wanted to BE her. 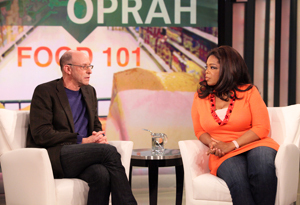 Recently, I watched as Oprah interviewed Michael Pollan about the documentary he appeared in, “Food Inc.” Pollan, author of “The Omnivore’s Dilemma”, focuses on the importance of natural, organic diets. For those who are not familiar with “Food Inc.”, this film targets companies such as Smithfield Foods, Monsanto, Tyson and other corporations claiming that they “control” everything from seed to plate. The film is jam packed with clips from those who are not scientific experts and the film implies that the above companies are responsible for the overuse of corn in the U.S. Specifically, “Food Inc.” recommends that consumers know more about the food they eat, keep business local, buy organic, and to show support for farmers. Obviously, the first and last recommendations are a given, and should be done. Organic and local purchases are choices to be made by the informed consumer. Less than accurate information and assumptions about agriculture are made throughout the film, “Food Inc.” For more information on specifics please view this sheet organized by the National Corn Growers Association. As I watched Oprah, along with her studio audience, get sucked into the mistruths about modern agriculture, I could feel my blood pressure rise. I didn’t grow up on a farm, but instead, on an acreage on the edge of town. I did, however, grow up understanding the importance of agriculture thanks to the 4-H program and my parents. After watching Oprah’s organic food episode, I commented on her Facebook page hoping that someone would take what I had written to heart. Much to my surprise, someone did! An organic farmer from Colorado sent me a message asking for more information on my views and a conversation began. Can you ask for a better teaching moment? The episode featuring Pollan just re-aired last week. Again, I was determined to write my thoughts on Oprah’s Facebook page. As I read the comments already there, I couldn’t help but notice the number of people claiming to have gone vegetarian or vegan after seeing “Food Inc.” If nothing more, I was hoping after I submitted my thoughts that I would feel less frustrated. After posting twice on the Oprah page, my privilege was revoked. My comments were respectful, truthful and not directed towards any specific person. Thinking it was a fluke, I proceeded to my separate Facebook account for work to realize it was true. Not only was I unable to post to the page, my comments had also been removed! I went on to post from my separate account but yet, today, I am still unable to express my thoughts on Oprah’s page from my personal Facebook account. What a disappointment—rejected by the iconic Oprah Winfrey, when defending the name of modern agriculture. Those of you that don’t watch shows such as Oprah, when someone like Pollan is featured, I urge you to do so. View this as your chance to be an advocate for agriculture. Seize the opportunity to teach someone about agriculture and the food we eat. Farmers, you know better than anyone about the food you produce. Let’s celebrate National Ag Week!